FAIRFIELD, Conn.—Sacred Heart University and the University of Saint Joseph School of Pharmacy have joined to offer a new bachelor’s and Doctor of Pharmacy (Pharm.D.) program that can be completed in six years. 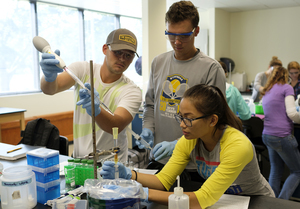 After three years, Sacred Heart students studying biology or chemistry will complete their remaining undergraduate credits during their first year at the University of Saint Joseph School of Pharmacy and will earn their Pharm.D. in and additional three calendar years. For more information on the 3+3 bachelor’s and Pharm.D. program, visit Sacred Heart University 3 + 3 Bachelor's & Pharm.D. Program with University of Saint Joseph School of Pharmacy.